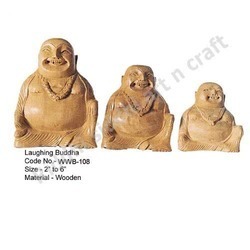 Offering you a complete choice of products which include lucky laughing buddha, laughing buddha carving, laughing buddha statue, handcrafted laughing buddha, laughing buddha standing and laughing buddha. 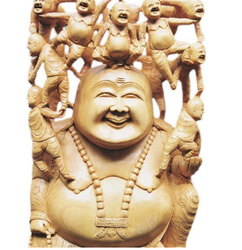 Laughing Buddha is also known as Buddha of Happiness. Legend dictates that nothing would make this Buddha happier to see people problem transform into happiness. 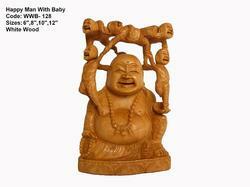 This is because of the image of the Laughing Buddha is believed to attract unlimited of prosperity and abundance of wealth lucks. For those who are engaged in any kind of business, I suggest you have one of this Deity in your house and your office to bring wealth luck and good fortune as well. They represent the later Buddhist nations that the good life was indeed attainable in this world. It consisted of self-mastery, a happy demeanor, purposeful endeavor, a deep commitment to the welfare of others and enlightened awareness. 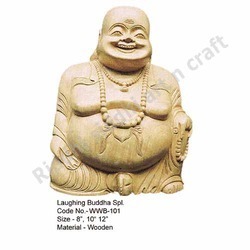 Scholars believe that the Laughing Buddha is in fact modeled on an historical figure, a fat wandering Zen monk named Pu-tai. All sources describe him as obese, with wrinkled forehead, and a white protruding belly which he left uncovered. There was another feature of his bodily appearance that captured attention. Wherever he went, he wore a pu-tai (Japanese Hotei) or cloth-bag. Thus he came to be known as Pu-tai Hoshang or hemp-bag monk. Legend has it that in this bag he carried candy for the children. Over the centuries within China, Buddhist notions of happiness based on self-mastery and enlightened insight were fused with popular Chinese life-ideals of happiness through material prosperity, thus today the hemp sack may be interpreted as filled with gold, filled with happiness, health, and other aspects of abundance. 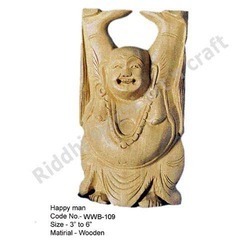 Our company specializes in crafting and offering a high end range of Laughing Buddha Standing statue of a happy fellow to bring you luck, health and happiness. 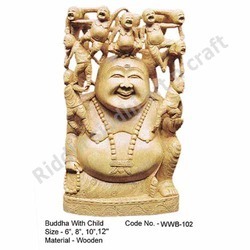 All these statues are fabricated with premium grade white wood bought from a reliable and experienced vendor. The entire range is so beautiful and attractive that it will win on people’s heart. 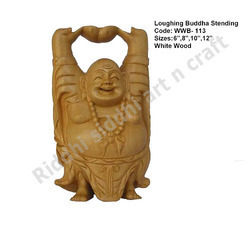 Laughing Buddha offered is designed by us using precious and highly valued sandalwood. 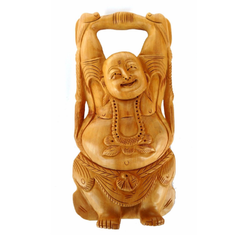 Symbolizing good luck, happiness, wealth as well as prosperity, the perfectly carved and crafted sandalwood laughing Buddha are just the right thing to be placed sat homes or at offices as these are popular good luck symbols recommended by Feng Shui consultants that help in enhancing wealth. Also bringing positive energy to its surroundings, these artistically crafted pieces also come with incredible details as well as stunning looks that make these perfect choices as gifts to near & dear ones.